I’ve been looking forward to And I Darken since it was announced, and I was beyond excited to receive an advanced copy to read and review. I have met Kiersten White several times, but this is the first book I have ever read of hers (I read her short story in My True Love Gave To Me and I own copies of her other books that I haven’t gotten around to yet). I don’t know why it took me so long to pick up one of her books because oh boy, I was impressed. And I Darken begins with Lada’s birth and her nurse praying she’ll be ugly. We watch Lada grow up and I love how tough, fierce, and protective Lada is from even a young age. Even though Lada would never admit it to him, she loves her younger brother Radu dearly and would do anything to protect him. About half of the novel takes place during Lada and Radu’s childhood, specifically their pre-teen years. This backstory is a little slow, but it is so necessary to understand the characters’ later motives. Speaking of character motives, it was heartbreaking watching Lada make decisions she thought were the best way to protect Radu and Radu interpreting them as her not loving nor caring about him. Kiersten White captured this perfectly, and I was hurting for both of them. I just wanted Radu to realize that Lada does love him deep down and was only trying to protect him. Once Lada and Radu are moved to the capital, the story’s pacing starts picking up. There, they met a boy their age crying in the gardens. They make fast friends with Mehmed, the sultan’s third son, and go off to live with outside of the city. However, after both of his older brothers die and his father decides to retire, Mehmed is thrust onto the throne as a twelve year old who is not yet ready to rule. After two assassination attacks, Lada and Radu decide that Mehmed needs to be off the throne until he is older. They conspire behind his back with his mother in order to force his father to come back as sultan. I loved how much the plot focused on politics. Where Lada was fierce and cruel, Radu was timid and soft-spoken. Radu used his likability to become confidants of the families in the court so that he could be on the inside as a spy for Mehmed. Another focus was on religion, which I was surprised by. I wasn’t expecting that to be a central part of the story, but it was and considering the time period, it makes perfect sense. 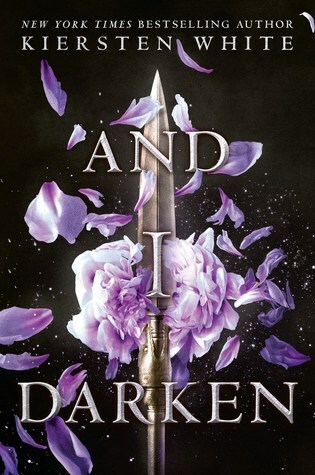 Overall, I loved reading And I Darken and I highly recommend it to fans of historical fiction. I absolutely cannot wait for the next installment! I loved this one so much. And I Darken is my favorite read of 2016 so far. I just love the darkness, Lada as a female, all the history thats interwoven, and so much more. Your review perfectly encapsulates how I felt while reading this book! I loved reading your review! I’ve seen and heard this book just about everywhere and I’m glad people are giving mostly positive thoughts about it. Now I just skimmed your review because I haven’t read it yet and I’m really excited to! So happy you had a great time reading this! I’ve seen this book everywhere and I can’t wait to find myself a copy. I love what you’ve written about the characters, and now I’m definitely VERY curious to see more of Lada and Radu. Thank you!! <3 I hope you love And I Darken as much as I did!